At this year’s MD&M West trade fair (Anaheim, United States), the sensor expert Sensirion and Quantex Arc Ltd will be presenting an innovative concept study in the field of infusion technology – Quantex’s new wearable drug de-livery IoT Platform “Quantex 4C”. Sensirion is a leading manufacturer of environmental as well as gas and liquid flow sensors. The cost-effective LD20 single-use liquid flow sensor, which has been used for this concept study, is exceptionally compact and measures flow rates in the micro and milliliter per hour range with outstanding precision and reliability thanks to the patented CMOSens® Technology. Additionally, it features sensitive failure detection mechanisms to help counteract, for example, occlusions and air-in-line. 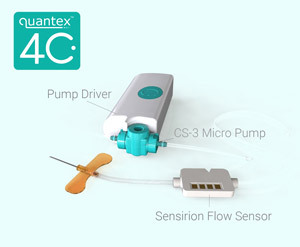 Quantex is an innovative leader in single-use disposable pump technology. The pump's design is based on a rotary, fixed displacement principle thus is much less sensitive to variables such as line pressure, fluid viscosity and flow rate. The new wearable drug delivery IoT platform "Quantex 4C" demonstrates an innovative approach to infusion therapies. It integrates connectivity with a modular drug delivery platform and enables continuous monitoring of the therapy with the help of a single use liquid flow sensor for safe ambulatory treatments. "Real time bidirectional flow verification at the low flow rates that are typical for the targeted application and the sensor's compact form factor made the Sensirion LD20 single-use liquid flow sensor the ideal choice", said Paul Pankhurst, Founder and CEO of Quantex. The objective of the presented study is to demonstrate the possibilities of a comprehensive drug delivery system to the medical technology industry. The compactness, low power consumption and cost-effectiveness of both, sensor and pump, allow the design of a wearable device which controls and monitors the drug delivery therapy simultaneously. Such a connected drug delivery platform opens up entirely new possibilities for all involved stakeholders. While patients and clinicians benefit from an increased ease of use and confidence in the therapy, low maintenance and less training efforts; it allows healthcare and pharma companies to capture vital adherence data and simplifies patient compliance. One of the hallmark features of Sensirion's products is the use of its patented CMOSens® Technology, which permits intelligent system integration of the sensor element, logic, calibration data and a digital interface on a single chip. Sensirion's credentials as a reliable supplier are emphasized by its quality certification (ISO/IATF 16949) as well as its loyal and renowned customer base.